The Church of St. Eleftherios is a small Byzantine-era Eastern Orthodox church in Athens believed to have been constructed in the late 12th century. 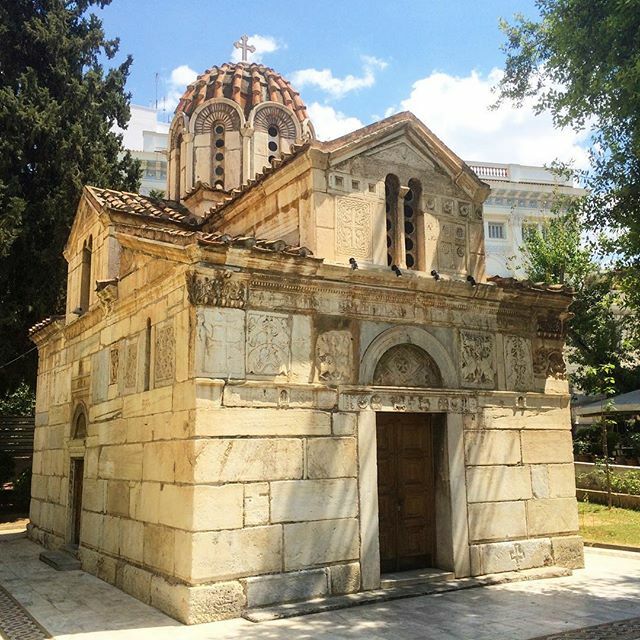 Now dwarfed by the neighboring Metropolitan Cathedral of Athens, it is often referred to as Little Cathedral, or “Mikri Mitropoli” which translates to “Little Metropolitan Church”. One travel guide noted that the small size of the church was representative of the smaller size of Athens in the era when it was built. What makes the structure of the church unique are the “spolia” on the outer walls, decorative sculptures which came previously built structures. A Wikipedia article claims that the use of such fragments in construction was a common practice in the era that the church was built.